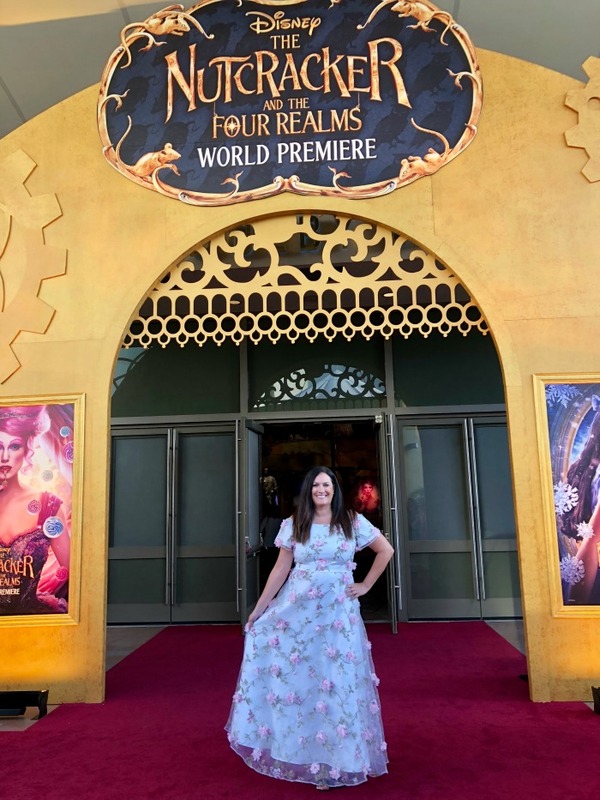 I just got back from an incredible few days in Los Angeles where I was able to meet and interview select members of the cast of Disney’s latest holiday film, attend the The Nutcracker and The Four Realms red carpet premiere, and most importantly watch the film (with the cast just rows behind – always a treat). I’m always watching a movie through the lens of a parent, even when my daughter is thousands of miles away. 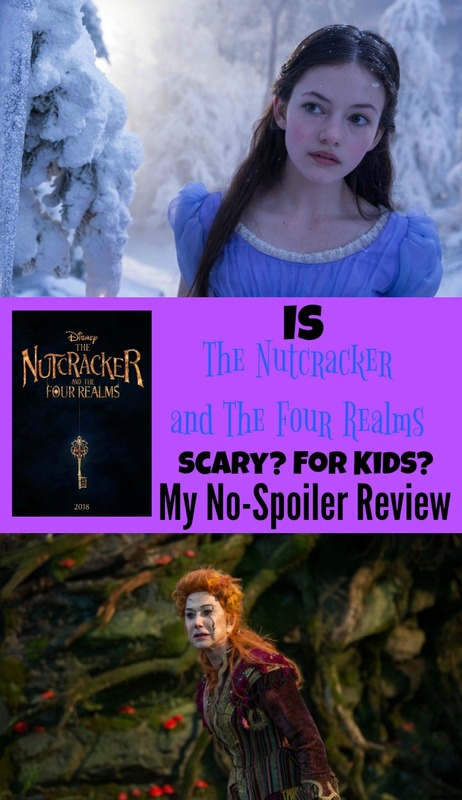 I know many of you do too, so I want to share my thoughts – is The Nutcracker and The Four Realms scary – is it for kids? Is The Nutcracker and The Four Realms Scary? Is It For Kids? 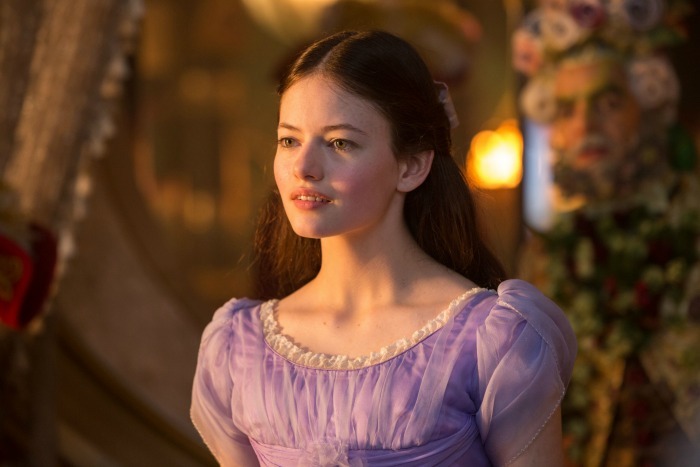 With a cast featuring A-list celebrities like Helen Mirren, Keira Knightley, and Morgan Freeman, I couldn’t help but be excited, but make no mistake, the star of the film is Clara’s Mackenzie Foy. 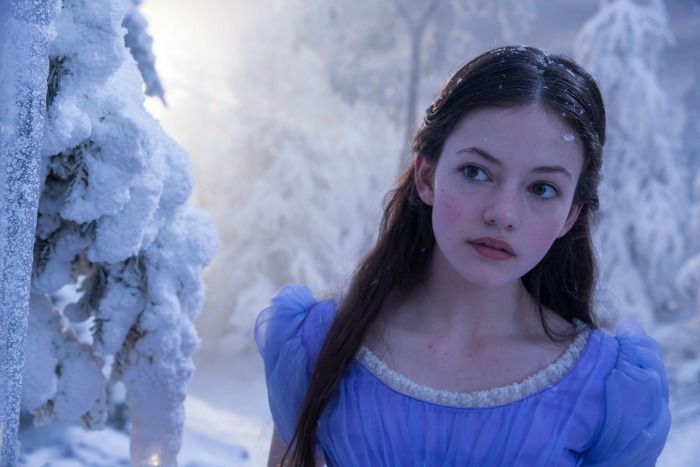 With breathtaking scenes, some reminiscent of a wintry Narnia, Disney delivers a holiday film that will delight the senses. 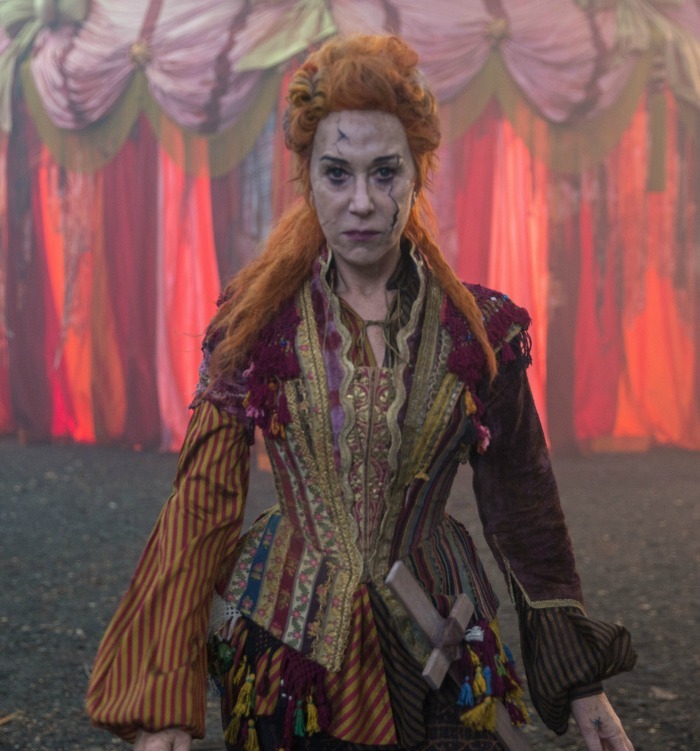 The backdrops are colorful, the costuming spectacular – I expect to see an Oscar nod in the near future. The Nutcracker ballet is a family tradition, one my mother started. I have beautiful and fragile nutcracker ornaments I hang on the Christmas tree each year. They are so precious to me, reminders of a very special Nutcracker ballet my entire family went to one evening during the holiday season. The Nutcracker ballet and the “The Nutcracker Suite” by Tchaikovsky are special indeed and I fear many will go into the movie theatre this weekend prepared for a movie version of it. They will be disappointed if they do. The Nutcracker and The Four Realms is not based on the ballet, but rather inspired by the book. It’s a completely different story. Moreover, while there is an enchanting scene where ballerina Misty Copeland tells a story through her dance, ballet is not the focus at all of this film. So for little girls who star in the holiday ballet every season, just prepare them that this story is different. It’s not the story they have known. It’s not a ballet. 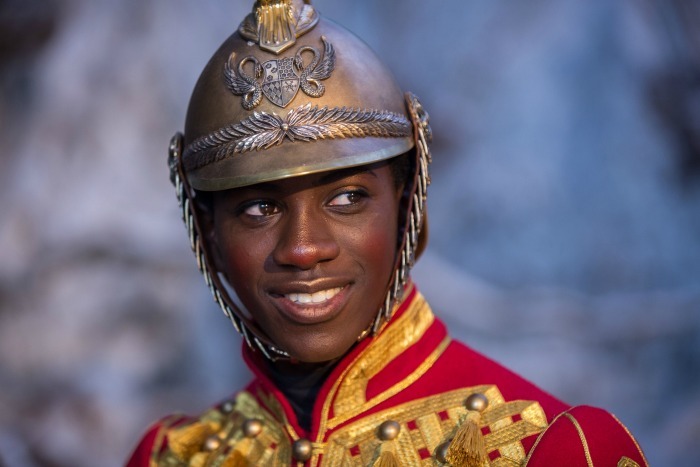 Is The Nutcracker and The Four Realms scary? From the trailers and sneak peeks alone, I know many of us were curious about the story. It appeared that the Fourth Realm would make the movie very dark. Mother Ginger looks a bit intimidating, there is no denying. While I won’t go into the details of the Fourth Realm, I will say that there are some moments that might make very young children nervous when Clara and the Nutcracker soldier are in that realm. It’s like going along with Snow White through the forest with the spooky trees – the unknown causes fear. Others who might be a little scared? Those who fear clowns. Yes, the Fourth Realm is technically the Land of Amusements, and there are clowns. They do not appear very much in the film at all, but they are there. The film is not dark as some might have thought, but there are unexpected twists and turns, which always makes for a good movie. I was surprised by how short the film was – approximately 99 minutes. That bodes well for children. I watched as grown women completely adored the book we were gifted this week. It was a picture book of The Nutcracker and The Four Realms, one which featured ballerina Misty Copeland on the cover, an African-American ballerina. For little girls of different ethnicities everywhere, these details are important. I guess that’s one of the things I love best about this film – the diversity in the cast. With age (Helen Mirren, Morgan Freeman). With race (Misty Copeland, Morgan Freeman, and the Nutcracker soldier himself – Jayden Fowora-Knight. As I sit here on the last day of the famed Day of the Dead, I’m reminded it was just a year ago that Pixar touched my heart with a film so touching, Coco. This week Disney touched my heart again, though differently. You see, as the movie begins, Clara is dealing with the approaching Christmas holiday, yet she is grieving the loss of her mother. Okay…I had to take a breath right there, as I lost my mom during the holiday season, just two days after we decorated the Christmas tree as a family. Clara’s father gives each child a Christmas gift that their mother wanted them to have. This is central to the story. Unfortunately it was also central to my story, as on Christmas morning my family opened gifts, though it was hard to go on celebrating without her. But there were two gifts that my sister hadn’t wrapped under the tree. We broke down in tears as we looked at my dad, realizing that he had found them in my mom’s closet. They were meant for us. I get choked up to this day thinking about it. So Disney, you had my emotions right where you wanted them, right down to the struggling father/daughter relationship that can often occur after the loss of a mother. I didn’t need a tissue like I have in previous movies and for that I am thankful. I don’t think your children will cry out loud, but there might be some children where this is a sensitive area. This music video of Andrea Bocelli (with Matteo Bocelli, his son) featuring one of the movie’s songs, “Fall on Me” shows all the emotion I was feeling. You can grab the incredible soundtrack here! The Nutcracker and The Four Realms – In Theatres Playing Everywhere Now! Like THE NUTCRACKER AND THE FOUR REALMS on Facebook, Twitter, and Instagram. Watch for more cast interviews with Clara (Mackenzie Foy) and the ballerina (Misty Copeland) coming soon, and read about my conversation in the dinner line with Morgan Freeman here in my The Nutcracker and The Four Realms red carpet premiere post. I think it’s interesting that this is NOT a ballet. But now I am even MORE excited to see it! Oh good! I’m taking the family to see it this weekend – can’t wait to see their reaction!